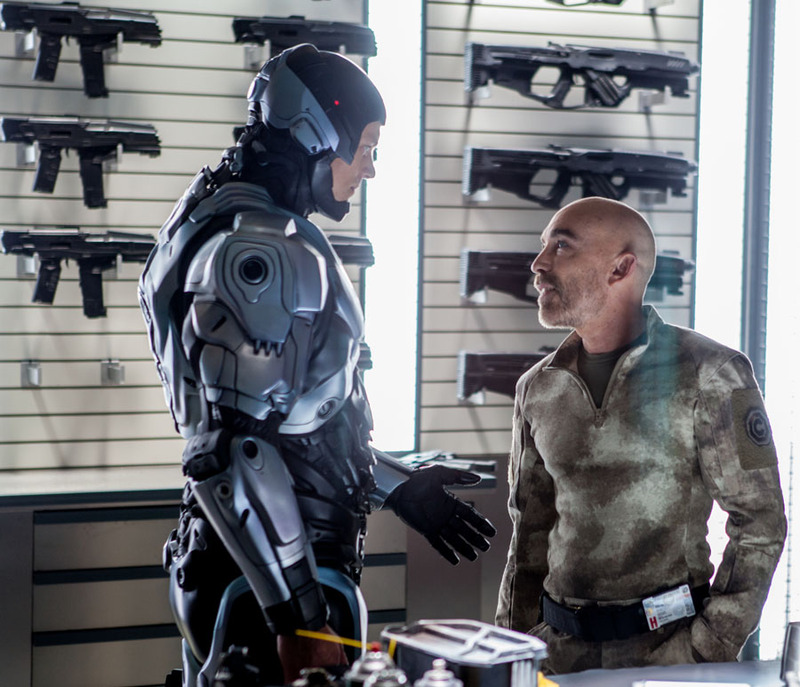 He’s a little bit human, a lot of machine—and a total throwback to 1987, when the original RoboCop first clicked, whirred and blasted onto the big screen as an R-rated whammy of speculative, satirical sci-fi about crime and justice, corruption, corporate greed, the media, and what might happen if we ever let computers do the thinking for us. This tamer, toned-down PG-13 remake follows the basic plot of the original, with a few tweaks. 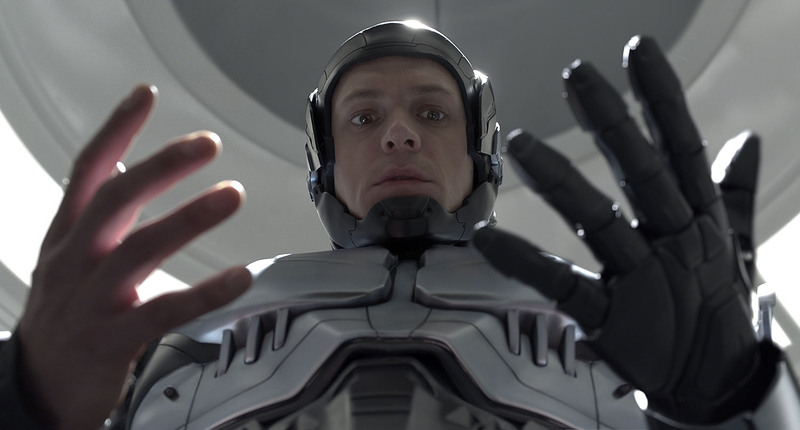 Here it’s 2028, and Joel Kinnaman (from TV’s The Killing) plays Detroit police officer Alex Murphy, whose remaining body parts are implanted into a rock-’em, sock-’em exoskeleton after a dangerous undercover mission goes awry. But Murphy’s high-tech reconstruction is underwritten by a mega-corporation with motives that aren’t exactly medical—and a billion-dollar stake in “privatizing” crime control. Michael Keaton is the corporation’s smarmy CEO. The always-dependable Gary Oldman brings subtle shadings of conflicted genius to his role as the researcher/physician/surgeon who integrates man with machine. Jack Earle Haley makes a dandy, devious foil as a robot trainer. Samuel L. Jackson pops in and out as a one-man Greek chorus, a TV talk-show host stumping for bots to do all the dirty work for police officers and soldiers. Back in 1987, that concept seemed a lot more far-off futuristic than it does today, when robots and robotic processes have already taken over all sorts of jobs once done by humans, and drone airplanes are doing widespread military surveillance—and more lethal tasks—as well as operations for police, firefighters and reporters. Jack Earle Haley (right) is a devious robot trainer. 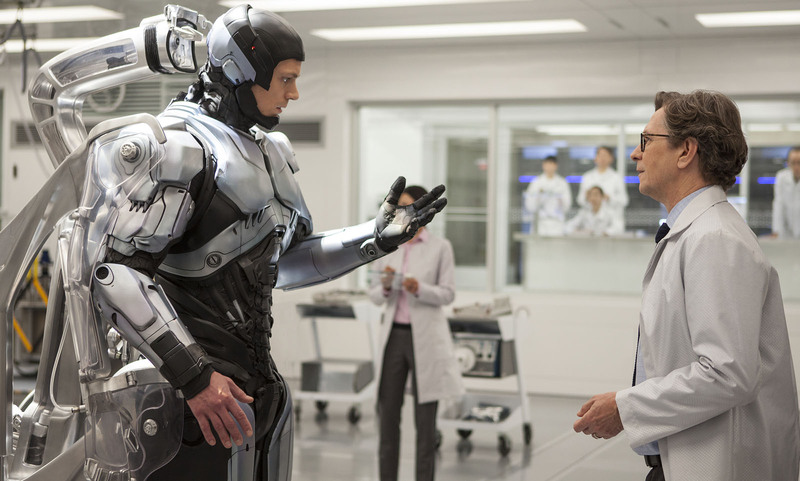 This RoboCop isn’t a total clunker. It looks cool and sleek, and Brazilian director José Padilha, making his first English-language film, keeps things moving at a lively action-movie clip. But after 25-plus years, too much of this rebooted robot tale just feels recycled instead of refreshed, especially compared to the visceral, original kick of its groundbreaking ’80s predecessor. I do have to give some props to the rockin’ soundtrack, however. Any movie that works in Frank Sinatra’s “Fly Me to the Moon,” orchestrates a shootout to the loony ’70s hit “Hocus Pocus” by the Dutch group Focus, and rolls end credits to the Clash’s cover of “I Fought the Law” gets at least one pop-cultural attaboy from me.